American Laundry News Appoints Hal Kanefsky as 2018 Textile Expert. Hal accepted the position in December, his introduction to the panel and readers is below. "Watching manufacturers make mistakes is how we build our company. In 1947 Monarch Brands was founded on repurposing textile irregulars and by-products for secondary markets. Over the last 20 years of working in the textile industry, I’ve seen just about every scenario of how laundry products are created, distributed, used, then discarded. When I began this journey in 1997, domestic textile mills were closing due to Central American and Asian competition. I followed the textiles, visiting countries around the world to develop a pipeline for product 'by-products', distressed merchandise, and irregulars. At the time, our value to our customers was in providing discounted merchantable products for industrial applications. However, it was during these trips that we began to identify the optimal way to deliver ALL categories of towels, sheets and microfiber products to the industry. Every mill has a strength (even failure is a strength for specific product lines). We mapped the global mill landscape to determine which mills to rely on for every quality of product offered, and hired agents in important producing countries to represent our interests abroad. Today, the resultant product mix satisfies every laundry textile need. We believe that reviewing the laundry processes allows us to spec and package particular commercial textiles for laundries in a manner that saves time and optimizes performance. One of our favorite challenges is working with customers to develop textiles that tackle a specific task within budget. A field expert, with in-depth vertical knowledge, spearheads the project. They orchestrate premier manufacturers, inspection teams, global logistics, and marketing outreach to deliver superior first quality private label textiles that out-perform the status quo. Our knowledge of opportunistic purchases allows us to present a different value proposition. Our company grew by understanding the practical spaces where irregulars provide a savings and functional value over first quality counterparts. By providing an outlet for our mills to liquidate obsolete inventory, budget-savvy laundries save money on products that just get the job done. Lastly, I recognize that our industry produces massive amounts of waste. To counter this, we offer textile buy-backs for laundry rag-out inventory. By recycling textiles for production credit, we provide a cyclical value to customers and keep millions of pounds of textile waste out of landfills. Our products have found national placement through distribution and laundry facilities as well as regional and national retailers. Categories now include a full line of microfiber cloths, mops, towels, sheets, top of bed and bath and accent rugs. I am a proud third-generation owner of a family business has grown to national prominence in 20 years. I have honed my skill-set through years of customer and manufacturer interaction, strengthened by my team of global industry experts. 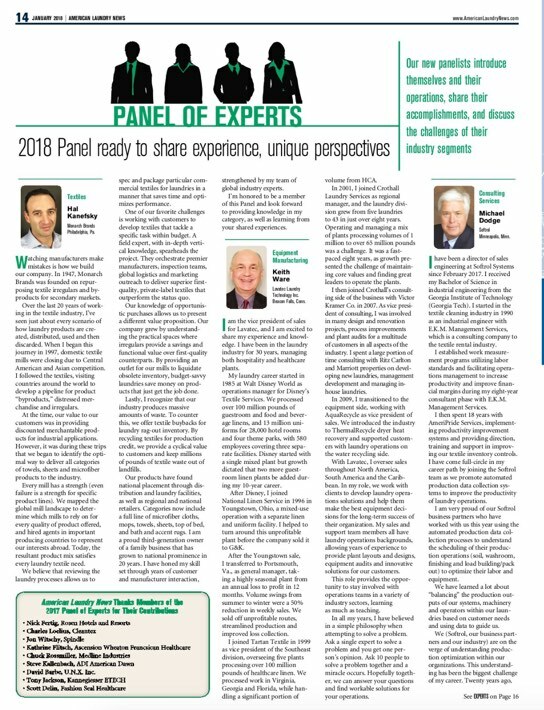 I’m honored to be a member of this panel and look forward to providing knowledge in my category as well as learning from your shared experiences."